Holyoke, Massachusetts, sits smack dab in the middle of the bustling Pioneer Valley, just off the Massachusetts Turnpike and I-91, about 90 minutes west of Boston and just north of Springfield. The city was one of the first planned industrial communities in the U.S. Back in the 1840s, industrialists began construction of a dam and canal system along the Connecticut River, and soon mills began sprouting up and attracting workers and their families, making Holyoke—once the home of the largest paper mill in the world—a destination for work and prosperity. Most of those mills have disappeared in the past century, but prosperity is still abundant, as high-tech jobs have moved into the region and diversified its economic base. And thanks to more than 32 regional colleges and universities, such enterprises as the Massachusetts Green High Performance Computing Center have been formed. 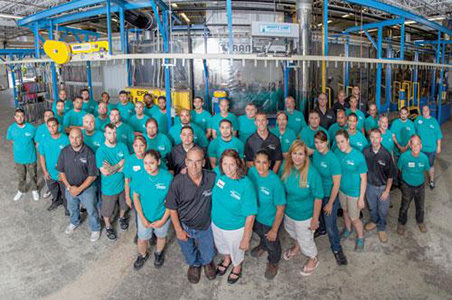 Holyoke is also the home of Westside Finishing, a 35-year-old powder coating facility that has also jumped on the technology bandwagon, recently installing new, sophisticated coating equipment and ovens that enable increased throughput and additional efficiencies to attract more customers. Owner Brian Bell is the hands-on president of the company, and his wife, Jeanne, serves as office manager. Son Korey Bell is Westside’s operations manager who helped oversee the installation of a new convection dry-off oven, infrared gel oven and a radiant-convection cure oven. Amiberica Inc. in Chicago was the general contractor on the ovens and conveyor installation, and Wagner installed a new powder booth. Bell says Westside used an existing three-stage pretreatment washer and an EPA powder booth as components for the new coating line, which complements four batch-spray booths and ovens the company was already using. Bell says one advantage of the radiant convection cure oven is that it works very well with parts of different sizes simultaneously, so a pipe with a 4-inch diameter can be coated alongside a 2-inch pipe in the same line without worrying about the oven temperature and line speed. “It give us great flexibility,” he says. Marty Kosiek, who heads the sales and distribution division for Amiberica, says infrared heat has been around for many years, but is rapidly gaining acceptance in the powder coating industry. Amiberica’s Northeast sales rep, Hani Azzam of Modean Industries in Easton, Connecticut, assisted the Bells in the design and installation of the system, which Kosiek says took about 16 weeks from order to start up. Westside Finishing made space by rearranging some existing equipment in its 30,000 square-foot facility, and the new IR installation actually saved the shop on space compared with conventional convection ovens. The Westside Finishing gel and curing ovens are heated with gas-fired “X-Trad” radiant burners, which provide medium wavelength infrared curing. Bell says the oven also cures using convection heat with the use of air recirculation. This combination provides excellent paint and powder curing. “It really is a more efficient way to perform curing operations,” he says. The design of the oven enclosures add to the energy-efficiency of the operation. Kosiek says the internal oven wall and roof layer is constructed with low thermal conductivity with 4-inch insulated interlocking aluminized steel panels, which is then covered with two additional inches of rigid insulation followed by an exterior corrugated steel panel. This multiple layer design eliminates nearly all through-metal heat transfer to the exterior of the oven. This design can often result in exterior wall temperatures 30 degrees lower than conventional oven panel design, resulting in the area around the coating line staying a bit cooler and more comfortable for employees. The recirculating power air seals at the entrances and exits of the ovens increases their efficiency. The vestibules are fitted with high efficiency recirculating power air seals to minimize heat spill into the plant. Inside the vestibule, a fan draws the hot air, which normally would spill out of the hook slot of the work opening, and discharges that hot air vertically toward the floor of the vestibule at a high velocity using special nozzles with adjustable discharge slots. Saving energy is important to the Bells, who strive to have their shop be a service-based company for their customers. Many of Westside Finishing’s key personnel have been in the metal fabrication industry for years working as fabricators, welders, grinders or as machining metal specialists, so they realize the importance of their finishing operation to fabricators. That is evidenced by Westside Finishing being the first custom coater to be PCI 3000 certified by the Powder Coating Institute. 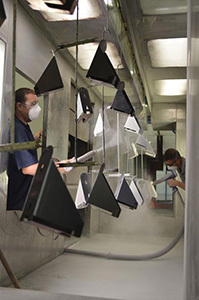 PCI created the audit program to evaluate a shop’s business practices, process elements, equipment capabilities, employee competencies and quality control capabilities to produce high quality powder coated product with a high degree of customer satisfaction. “It’s important to have the right people with the experience to do the job, and that’s why we expanded with the new line, so that we could offer more to our current customers and create opportunities with new customers,” Bell says. 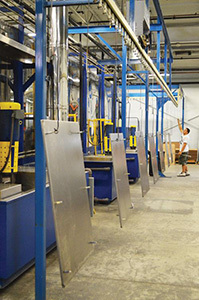 Westside Finishing’s conveyorized powder coating line, which accommodates parts up to 3 by 5 by 12 feet, is variable from 3 to 9 feet per minute. 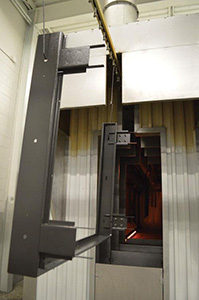 It has capability of performing a base coat and top coat in one pass and includes a three-stage stainless steel iron phosphate washer, a 60-foot-long, 6-foot-wide dry-off oven that provides 10 minutes of dwell time, a powder booth with a pair of powder coating guns, and a cure oven that is 50 feet long by 22 feet wide with a 20-minute dwell time at 6 feet per minute. The Richards-Wilcox enclosed track conveyor system is 720 feet long. Bell says the top coat is then applied in a new Wagner SuperCube booth, which has 10 fully automated guns as well as two manual spray guns. Final curing is accomplished in an infrared enhanced convection oven with a dwell time of 25 minutes at 6 feet per minute. 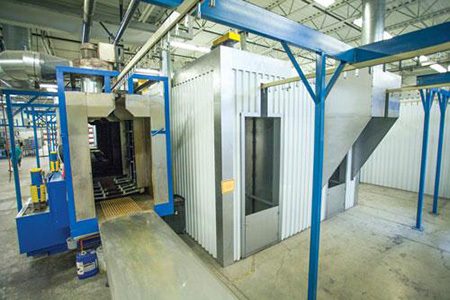 For batch work, Westside Finishing uses booths from Global Finishing, JBI and Nordson, along with four batch ovens. They can accommodate large parts, as they have an oven that measures 12 by 12 by 16 feet, as well as another oven measuring 8 by 8 by 20 feet. In addition to a three-stage washer, pretreatment includes a two-stage cabinet washer with an 8-foot diameter turntable and 92 inches of inside work height. The shop also has pad printing and silk-screen printing systems in place, services that are very much needed for their customers, Korey Bell says. “Keeping the work in-house is very important to our customers and to us,” he says. The shop can do screens up to 42-inch by 60-inch with two in-house silk-screen exposure units. Westside Finishing is serving industries such as sheet metal fabricators, machine shops, and ornamental iron workers, among others. Brian Bell is betting on opening up to a new set of industries with the additional conveyor system and powder coating operation. For more information on Westside Finishing, visit wsfinish.com, or call 413-533-4909. Information on suppliers: Amiberica Inc., amiberica.net or call 773-247-3600; Wagner, wagnersystemsinc.com or call 800-473-2524; Modean Industries, modeanindustries.com.